The United Nations’ General Assembly usually provides a time and place for world leaders to work on resolving some pressing global issue. And now, thanks to Donald Trump’s increasingly unhinged actions, the U.S. is the embarrassed parent at this student-teacher conference, what with the president having sided with white supremacists, denounced peaceful demonstrations by black athletes, and threatened fellow UN member North Korea with nuclear annihilation while at the freakin’ UN. 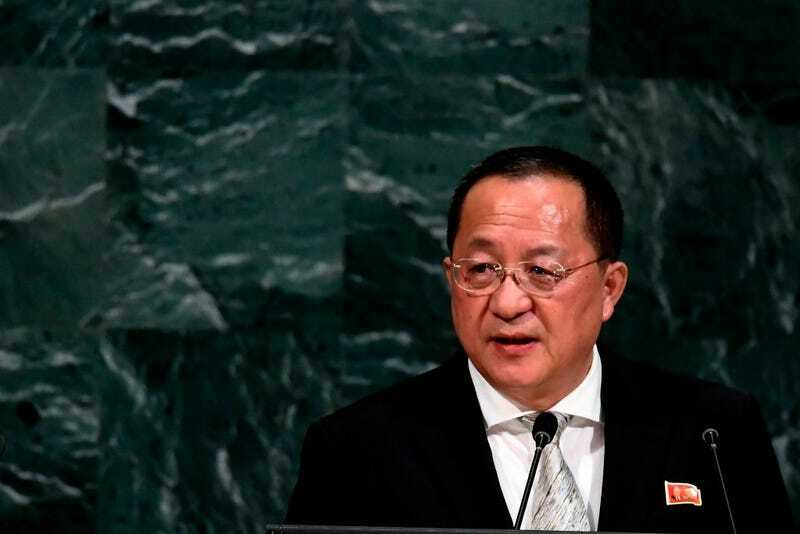 The foreign minister addressed Trump’s “warning” that if Ri Yong Ho backed Kim Jong-Un while at the UN, then North Korea “won’t be around much longer,” saying by doing so, Trump had “declared the war on our country.” The North Korean official told the UN it “should clearly remember that it was the U.S. who first declared war on our country.” Now, you probably don’t have to go out and build a bomb shelter (though you really should already have one at this point), considering North Korea previously referred to an average comedy like The Interview as an act of war. Then again, that film led to the huge Sony hack, so maybe there’s cause for concern after all—at least, if you’re a movie studio exec.